I picked this one up a month or so ago from the Kanebo salon and I believe that this one is a new design from Coffret D’or. 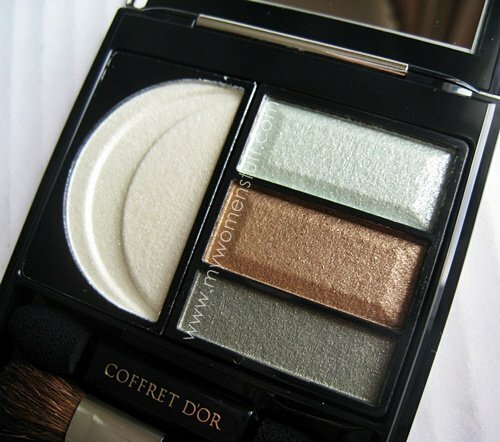 I used to be a huge fan of Kanebo makeup but they got boring after they launched Coffret D’or. This has been the first Coffret D’or item I’ve purchased in a long while and I must say I rather like it. Been using it and its versatile for work and play. As with all Japanese style eyeshadows, the colours do tend to be rather light and shimmery. The reason I got this one and not the previous palettes is because there is more colour and less shimmer in this palette. There are 5 colour palettes available (view here). Mine’s 05 Khaki Green – no prizes for guessing why 😛 I’ll have swatches up in a few. What’s the C-shaped thingy for, if you don’t mind me asking. Hurrah for liking palettes! 😀 I like sheer colours too – it less easy to make a mistake 😉 This one is less disco-bally than the previous ones, thank goodness! I prefer their Lunasol range. You’re right. Coffret D’or just doesn’t have that oomph! factor. It’s a bit boring. Even Shiseido’s Maquillage is more exciting. In fact, this palette reminds me of their Kate range. Kate also more mojo than Coffret D’or. I have a lunasol palette and I thought the quality can’t compare to Coffret D’or’s. So much fly away powder. I tried one from Esprique Precious and I’m loving it. Very blendable. Anyway, I think the palettes are nice to see…not good for limited storage space. The colours gets repeated very often and not worth it to collect. Lunasol is very hit or miss I’m finding. Their first release was pretty good. Then they went down the drain but the latest doesn’t look too bad. I haven’t tried the Esprique Precious eyeshadows, just the blush and its not bad. I guess I gotta look at that one.